All transactions are safe and secure with a reliable history in online purchasing behind each of our associates. Buy the Thor Power t-shirt to own Thor clothing and merchandise. 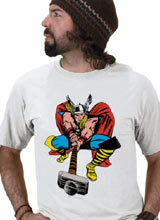 The Mighty Thor shirt here shows him adorned in his classic Marvel Comics attire, including a blue outfit, red cape and winged helmet. Most importantly, he is equipped with his sturdy Mjolnir hammer. This weapon of choice is known for its crushing ability. If thrown at a target it will return to its owner's hand. If the urge strikes you, snag your very own Thor toys, including costume helmets and Thor hammers. In addition to the Thor Power tee above, browse the Thor Clothing Gallery for more apparel like men's and women's clothes, kids shirts or hoodies.